Because apparently buyers asked for it, here's the 2011 Ford F-150 SVT Raptor SuperCrew. Four swingin' doors and 12 more inches of wheelbase for full-size adult haulage, a standard 411-hp 6.2-liter V8 and all the dune-pounding goodies of the original. 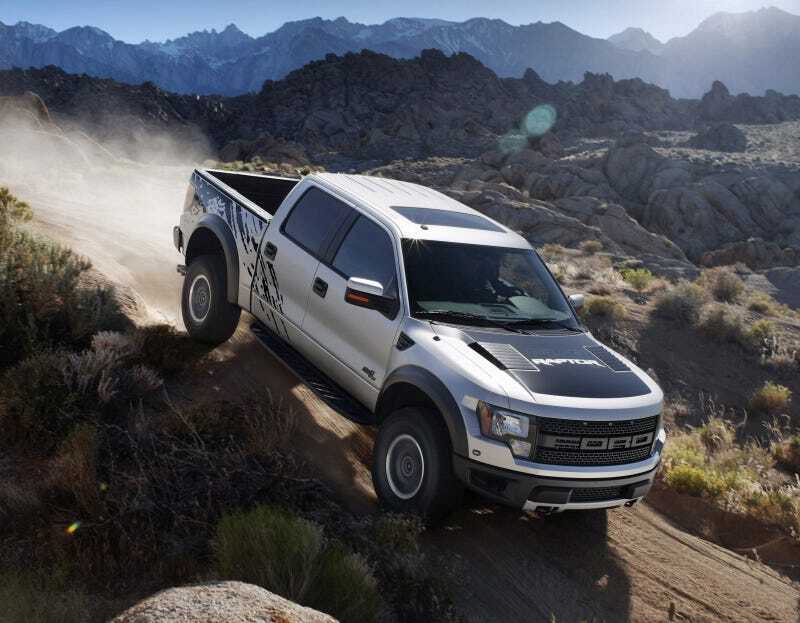 When the Ford F-150 SVT Raptor first launched, it blew everyone away with its awesome off-road performance. But there were two things buyers asked for; more power and a SuperCrew body option. Ford took care of the first ask by dropping the all-new 411-hp, 434 lb-ft 6.2-liter V8 into the Raptor, an upgrade from the long-in-the-tooth 5.4-liter. Now, to take care of the second ask, they've added the SuperCrew option. However it's not just the same truck dropped into a bigger package. First and foremost, the 6.2 will be standard for the SuperCrew. There's no 5.4 available since not only will it be going out of production shortly (and therefore also not be available for the regular Raptor) but Ford needs the bigger engine to motivate this larger Raptor. The fuel tank is also bigger — a 36-gallon fuel capacity. That'll mean more time out on the trails. It's also beefier with a bigger 8,000 pounds towing capacity and another 100 lbs of payload. The cushy-over-bumps predictable-on-the-asphalt ride and handling have been maintained by tuning the Fox Racing shocks and springs front and rear. But the most surprising part is the weight. The SuperCrew only weighs 194 lbs heavier than the SuperCab Raptor. Judging by the ridiculously fast sales rate so far, we suspect the pent-up demand for the crew cab will make this desert bruiser a hot commodity.